See more photos from AuBAR, Fortune, and Republic here! I was commissioned by Stephen Sawchuk from House of Leo Productions to film(video) the fashion shows. You can contact House of Leo here! They are the official video production company for Vancouver Fashion Week. You can find some of the videos I took at VFW 2010 for Blackout Productions last year here (again with Stephen Sawchuk, the modelesque Producer of House of Leo Productions). Photos from the opening party are in this flickr page. Look in my flickr collection for photos from the shows I wasn't filming. Something Awkward? You'll notice most of my photos are closeups of the face. It's for the makeup artists. All the official photographers down the center can get a million body shots of each, showing off the dress. *I try not to talk to the models. The makeup artists will beat me up because I always make them laugh and ruin their makeup. I'm going to guess it's my haircut or accent or something. 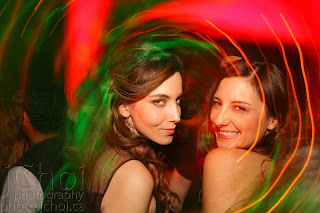 After party photos are here. Nightclub photos. It's what I do. Well, when I'm not off filming in the jungles somewhere. Your chance of getting good photos increases when you come to the after party and hang out. Well, with me anyways. For the runway, I used a Canon 7D with a Canon 70-200 2.8 IS II . For video, the crop sensor gives me a wider depth of field at the same light level using a full frame, making focus pulling easier. It also allows me to punch in to close ups to show details on the dresses. Lauren Holmes was on the other side getting the wide angle with a JVC GY-HM100U ProHD camcorder. Last year I used the 70-200 f/4 but this year I was taking photos for some of the shows, so I brought the heavier 2.8. Combined with the super fast tracking+autofocus of the 7D and 70-200 2.8 IS II, I was able to obtain sharp images 9/10 times (wider depth of field on crop sensor also helps for autofocus). And I automate all my processing, so I can pump out the pictures quick. I should just write a full on strategy guide for next season. Anyways, photographing models is definitely easier than shooting platypus or monkeys.